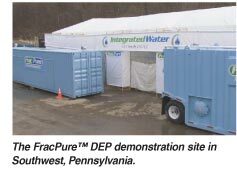 Integrated Water Technologies successfully completed a demonstration of FracPure™ Produced Water Remediation for the Pennsylvania Department of Environmental Protection in Southwest, Pennsylvania. The project was conducted under Industrial Waste Demonstration Project Permit No. 2610201. The demonstration proved the effectiveness of FracPure™ in removing heavy metals, total dissolved solids and suspend solids from hydraulic fracturing produced water, exceeding the EPA and all state regulatory agency recognized drinking water standards of 500 PPM . Problem: Hydraulic fracturing produces millions of gallons of contaminated water at each well. Contaminants included heavy metals, Total Dissolved Solids (TDS), organics and Total Suspended Solids (TSS). Disposal has consisted of dilution and deep well injection. Neither method removed contaminants prior to release into the environment or met EPA Drinking Water Standards. Solution: FracPure™ water treatment units used chemical precipitation, filtration, evaporation and crystallization to remove all contaminants and create water safe for return to the environment. Result: Frac and produced waters were turned into 99.7% dry and liquid salt products and distilled water exceeding EPA and all state regulatory agency drinking water standards. The FracPure™ Process averaged significantly less than 100 parts per million of total dissolved solids, which was safely returned to the water table and into rivers and streams.